Karen and Greg are teenagers in love. More than that, they are connected by an invisible bond that makes their love seem unbreakable. Life is a mix of exams, discos and walks in the park. Kissing, holding hands and dreaming of their future. One stupid misunderstanding breaks the bond and here begins a lifetimes worth of ‘what-ifs’ and bad timing. 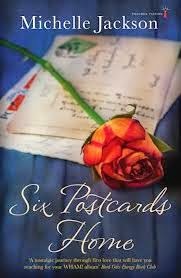 Over the decades, Greg sends the occasional postcard to Karen, letting her know that he thinks of her, as much as she does him. Life moves on, from Ireland in the 1980s, across America and Europe, but will their love for each other ever lose its intensity? Michelle Jackson has written a story of young love in Ireland and using her experience as a travel writer, has weaved some great locations into the tale. She describes the North Dublin areas of Sutton and Howth very lovingly and anyone who is from the area will know the street names, landmarks and pubs that are mentioned throughout. The Grove disco was indeed a rite of passage in the 1980s and many a romance started there. However, there seems to be a trend for this kind of story lately and while I am all for the nostalgic flashbacks to the 80s, this particular book was a bit too serious for me. There was very little humour in any of the memories and I know that young love is intense and all consuming at that age, but there are definitely some laughs and giggles along the way. I like the mention of Top of the Pops and what songs Karen was listening to at the time, but I still couldn’t connect with her teenage self. She seemed too one dimensional and lacked a realism that would have brought the story alive. Greg began to annoy me with his teasing phone calls, visits and postcards. I could feel the bond that was there between them and the sexual tension that built up over the years was well written, but due to decades passing by with no real story to grip to, I soon gave up caring too much. In saying all that, I did enjoy the book. I read in two sittings and kept turning those pages. Michelle’s writing style is fluid and easy to read with good chapter lengths. I also loved the addition of the pictures of Greg’s postcards. Even the stamps are accurate. I had penpals, back in the day, and recognised the stamps straight away. Overall, had the book been edited down a bit, it may have worked better for me. Less Howth and more story. Poolbeg seem to thrive on books based near the Irish coastline, but after years of reading the same descriptions of the landscape of the same areas, I would like to see more books about the rest of Dublin, or indeed the many other beautiful parts of Ireland. Six Postcards Home is published by Poolbeg and is available in paperback of e-book.